This summer its all about cooking food that's going to be handy. Ready to throw into a bag at a moments notice or when you've made a last minute decision to go out! For the past two/three weeks, we've been going out a lot while we are still decorating our house! My daughter bagged a few tickets to some live shows, X FACTOR and TOP GEAR! The X Factor is a British television music competition to find new singing talent, contested by aspiring singers drawn from public auditions. 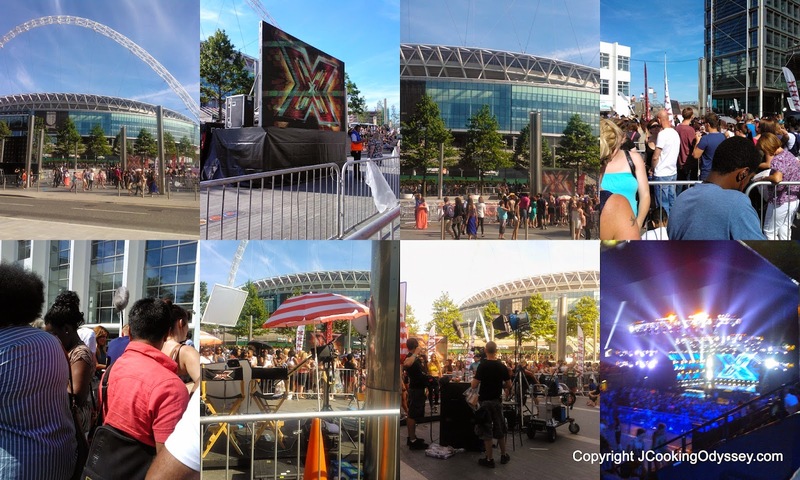 The X Factor is the biggest television talent competition in Europe and has proved hugely popular with the public. Top Gear is a British television show about motor vehicles, primarily cars, and is the world's most widely watched factual television programme, we have two very die hard fan of Top Gear in my house hubby and our daughter, yep she is car fanatic !!!!!! We were really lucky to see lots of celebrities! From the X Factor live auditions, we saw Nicole Scherzinger, Sharon Osbourne, Gary Barlow and Louis Walsh!! 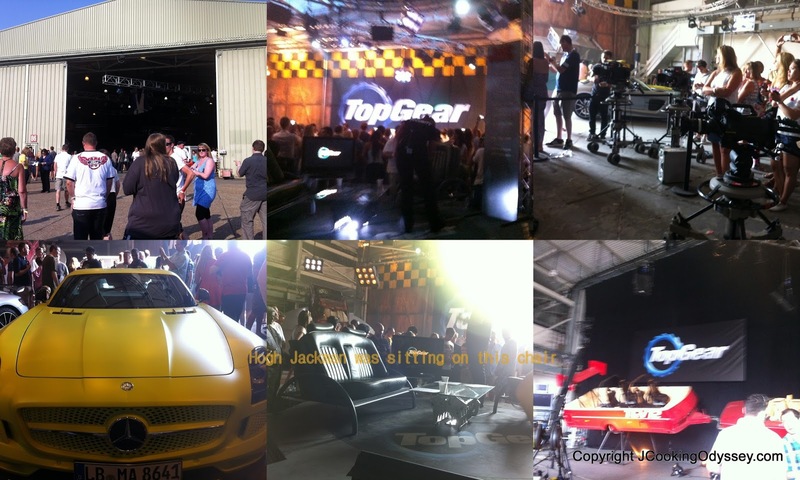 At the Top Gear recording, we saw Jeremy Clarkson, James May and Richard Hammond. To our surprise, Hugh Jackman was the guest celebrity at that weeks live recording. He was there to promot his new movie The Wolverine ! The atmosphere during a live recording is great! You get to see how shows are recorded which is always a surprise! It's almost always shot back to front! The only drawback was that we couldn't take pictures as the show was recording :( luckily, the memories will always be in our heads!! It isn't too difficult to make and it's a very crunchy spicy, tasty and yummy snack which is great for anyone and perfect with tea or coffee! If you're para crazy then check out my Sugar Coated Shakkarpara and Jaggery Para and let me know. Red chilli powder 1 tsp. Mix all the masala powder ( to sprinkle ) in one bowl and leave it aside. Mix chickpea flour, plain flour, semolina, 100 ml oil, salt, sesame seeds, ajawain seeds and red chilli powder in a bowl. Cover with wet cloth and leave it 10-15 minutes. Divide dough into 4-5 equal parts. Make a ball from each part of the dough and roll into a circle on a flat surface with rolling pin about 1/2 " thick . Prick the circle with fork so para doesn't fluff up. Heat oil in a heavy bottom kadai , fry the paras on a medium to low heat until brown. Remove it from the hot oil. Sprinkle masala powder which prepared earlier and let it cool to room temperature they will go crispy. Note :- Please do not get confused with this recipe thinking that these are regular Fafda or Choraphali fafda, they both totally different recipes. Check out my Fafda recipe and look forward to see Choraphali fafda recipe in near future. Linking it to Made with Love Mondays . Glad to see that you and your family had a great time in both X factor and Top Gear. On top of it, you have prepared such crispy and delicious looking patties. They look yummy. delicious crunchy snack...hi Jagruti I am first time here..please do visit my place too in your spare time thanks..also I am hosting an event with giveaway..
Looks and sounds absolutely delicious and more-ish!